Fall is approaching and a common garden pest, the fall webworm (Hyphantria cunea) can become noticeable on trees, causing unsightly larval nests covering entire branches, resulting in stress to the tree and severe leaf damage. Fall webworm are caterpillars that weave loose webbing around the tree’s outer foliage while feeding on leaves, compared to tent caterpillars that appear in spring and build their more opaque nests within the inner crotch of the branches. The webworm caterpillar is approximately one inch in length with a light greenish-yellow body and black to reddish head. Adults emerge later on as white moths with dark spots on their wings. The best way to eliminate fall webworm is to remove the infected branches immediately, before the larvae hatch and take over the tree. If the caterpillars have already left the nest, it is recommended to spray with an organophosphate insecticide such as Acephate (contained in Orthene or Sevin) or Malathion. Acephate is both a foliar and soil systemic which keeps on working 10–15 days after application. Malathion is a foliar insecticide which is also commonly used, but note that Malathion may leave a residue. The best proactive method of killing overwintering larvae is to apply a dormant oil in early spring while the tree is dormant. Dormant oil is a more natural solution and works by smothering and killing the overwintering eggs. In the spring, adult moths emerge and deposit eggs, continuing the life cycle of the caterpillar. These caterpillars may go through as many as eleven growth stages before leaving the web. For more information on gardening tips and design inspiration, visit my author page or the links below. Author: Lee@Landscape Design By Lee 2018. All Rights Reserved. 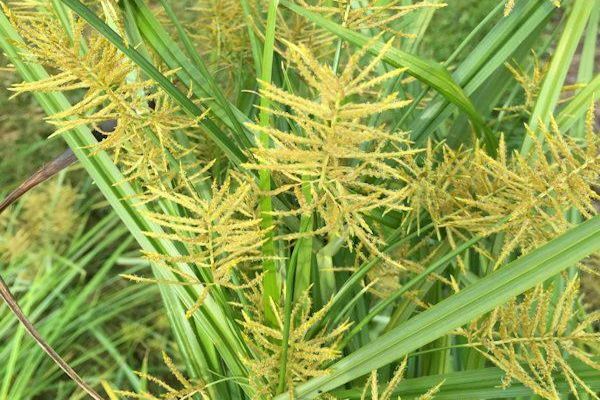 If you see an unknown plant emerging in your garden or lawn that looks like this…it is known as Nutsedge, also known as nutgrass. Nutsedge is an erect, grass-llke perennial member of the sedge family. It emerges as a pale green spike starting in late May and is similar in appearance to a grass seedling. When a shoot reaches the surface, it forms a basal bulb which grows into a new plant, including roots that develop new tubers at their ends. This process takes approximately three weeks and the plant spreads rapidly throughout the summer months. Nutsedge does die back in winter when frost kills all top growth; however, most of the viable tubers will survive and sprout the following spring. 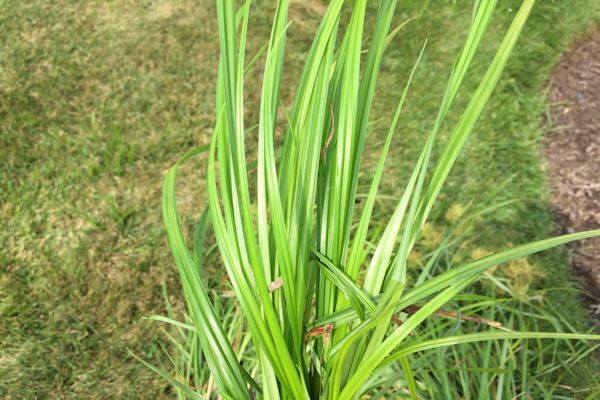 If you see nutsedge in summer the best remedy is to remove it immediately, making sure to get all the roots and tubers. Tubers will be well beneath the soil and white shoots will be visible after pulling out the main plant. Be sure to get all the new shoots and check regularly to see if any plants re-emerge. 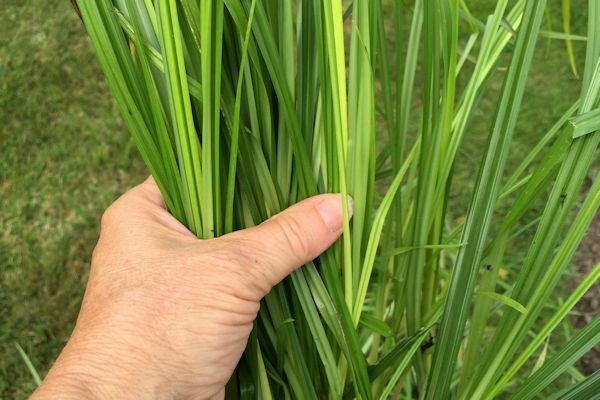 The use of selective herbicides over the past twenty years has reduced competition from other weeds and allowed nutsedge to grow and spread more easily. Once established, this weed can be hard to control because its tubers have high energy reserves, multiple buds, and a long sprouting period. An addition, the tubers are resistant to systemic herbicides because the chemicals travel from the top growth of the plant into the roots and rhizomes but not into the tubers, which multiply. The most effective treatment is application of a pre-emergent in early spring. When nutsedge matures in the perennial border it develops long shiny leaves that resemble the foliage of daylillies. It also produces flower spikes in late summer as seen above, which can be misleading. Keeping on the lookout, along with a little proactive maintenance, will prevent this determined weed from taking over your landscape. 2015 Lee@ A Guide to Landscape Design & Maintenance. Book Launching: Introducing My Second Book-Landscape Design Combinations!